Not the garland, just the wreath. 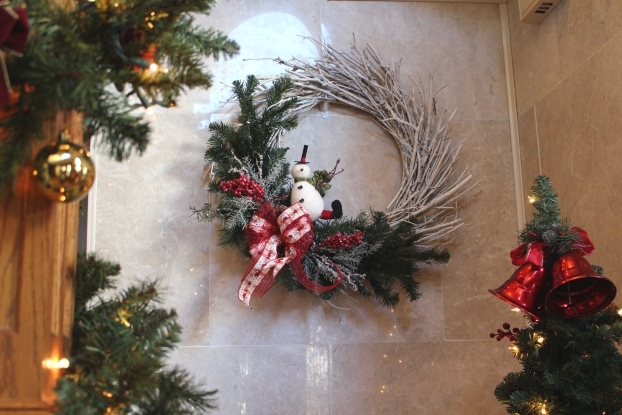 It was perfect for my Christmas Home Tour and I thought since it was just a snowman, it could hang out with us a little longer. But my husband said this is the reason Spring has eluded us. Seriously? I took it down immediately and anyone who lives near me, I’m sorry, it’s all my fault. In search of what to put there, I headed to my garage and guess what I found? Hmmm…Yes! I found three of these for $5 at a yard sale last summer. What a deal! It was first thing in the morning and the poor woman was so overwhelmed and of course I didn’t argue. I snapped them right up. But they’ve just been taking up space in my personal yard sale thrift store estate sale dumping ground our garage. I wanted it to have a bit of an aged feel, but I didn’t want to sand the metal. 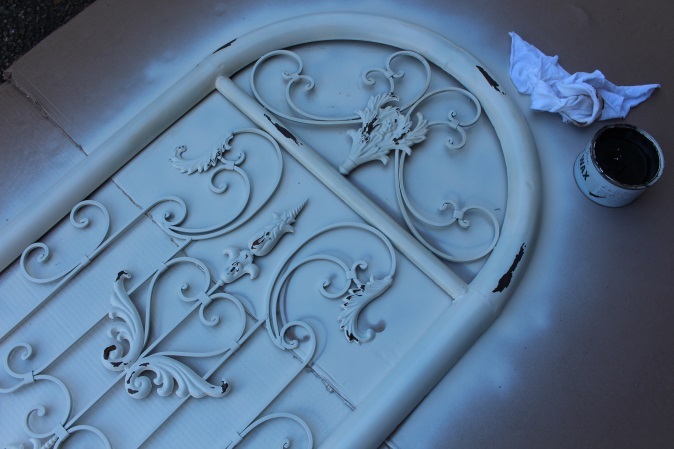 So before spray painting with Rustoleum’s Heirloom White, I added a little petroleum jelly here and there. The paint did not adhere in those spots, so I was able to use a cloth to lightly rub away the paint. I like the overall effect. I rubbed in a little of Annie Sloan’s dark wax to age it a bit more. I had just done the top portion in that photo. I’m loving the result. It’s hard to see the aging in photos, but it’s just enough for me. I think it works with the staircase. Now if we could just get rid of the carpet. I’m really pleased with how it turned out and you can’t beat $5. There are a few metal scrolly pieces I’ve donated or sold at yard sales over the years that probably could have been saved with a little spray paint therapy. How about you? 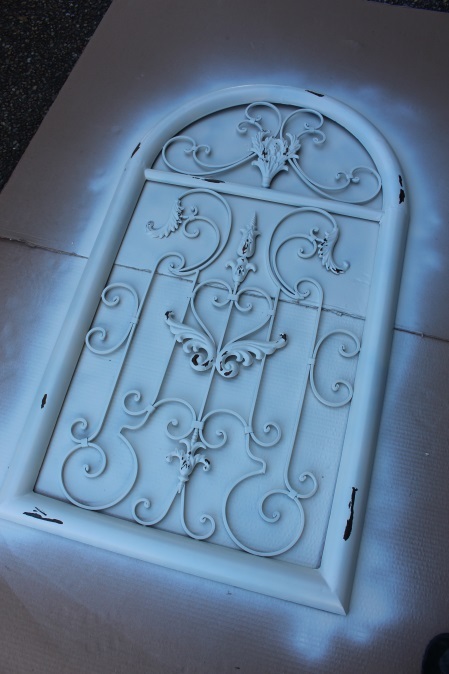 Have you ever spray painted metal work? 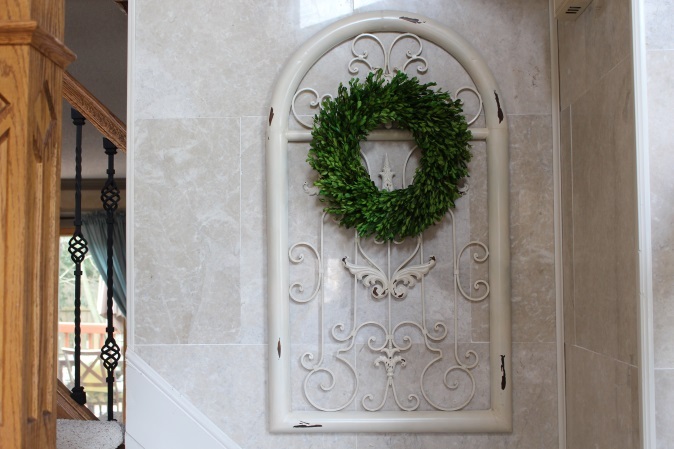 More importantly, do you still have your Christmas wreath up? If you like what you see, there are several ways to follow along! Never miss a thrifty makeover! Receive my new posts right to your inbox! Very pretty, doesn’t look like a $5 find. Please come share at Bacon Time linky. So pretty! I love it in white! And for $5 what a deal!! 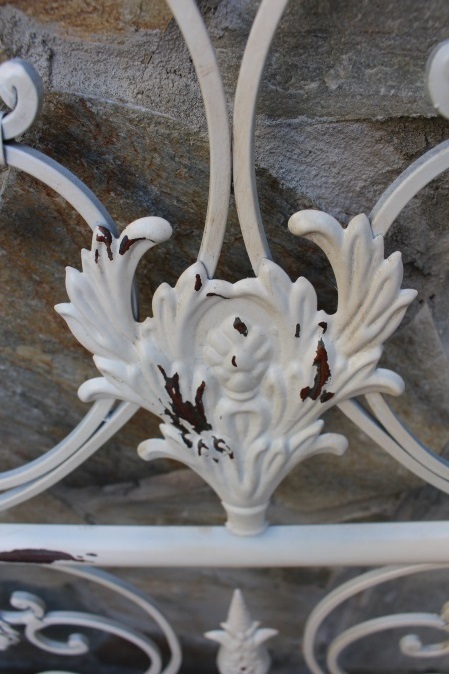 I have sprayed a number of metal objects but I recently bought 2 casted decorative railing pieces from England and I will be painting them with silver and them just a bit of gold to warm it up. Then I am going to frame them and display them in my master bedroom. I have also sprayed quite a few metal trays, some are silver plated but the finish was ruined so why not paint away. 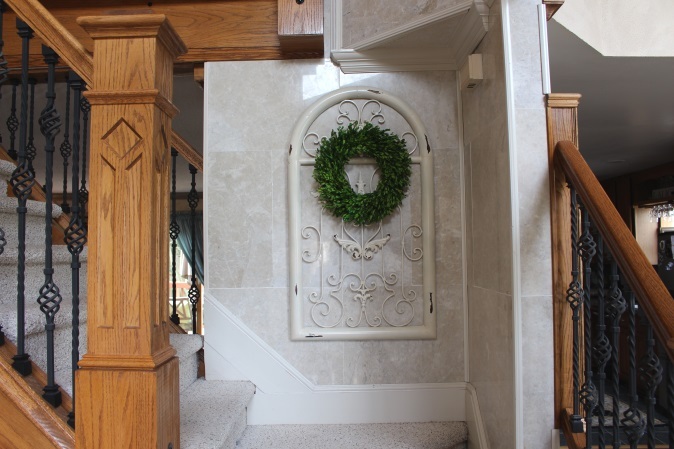 In answer to your second question, I just took my Christmas wreath down. It was pinecones and fake green and I have attached a chalkboard sign saying, Welcome Friends. I figured it could stay up til the end of winter which seems to be over here in California. 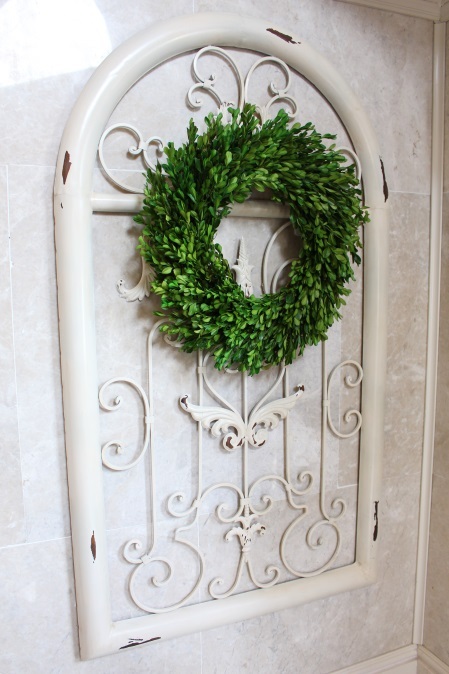 Christy, what a great piece and the boxwood wreath looks wonderful on it! You always find the best stuff and give it such amazing new life. I cannot even admit to you how much of my Christmas decorations are still up – I swore last year it wouldn’t happen again, I’d be better organized and more on top of my blogging time. THAT didn’t happen, lol. Hubby is saying we should put some Easter eggs in Christmas village with a sign that says “Closed for the season.” 🙂 Thanks for sharing this and pinning! Have a happy Tuesday! Awesome $5 Yard Sale find and it fits perfectly in your space! Well done! Oh my, this totally speaks to my ‘shabby at heart’ heart 🙂 I love how the middle section looks like angel wings now! You should totally send one of these my way 😉 I spray painted my faux metal tissue paper holder in my bathroom and a real metal shelf that I put above the ‘throne’ the same hammered bronze when we moved into our home last year…to make it look cohesive (one was that fake shiny silver, the other was black). Now they look great. I did go through a whole can of spray paint though!! I’m so glad you like it, Cindy! Spray paint is awesome!! 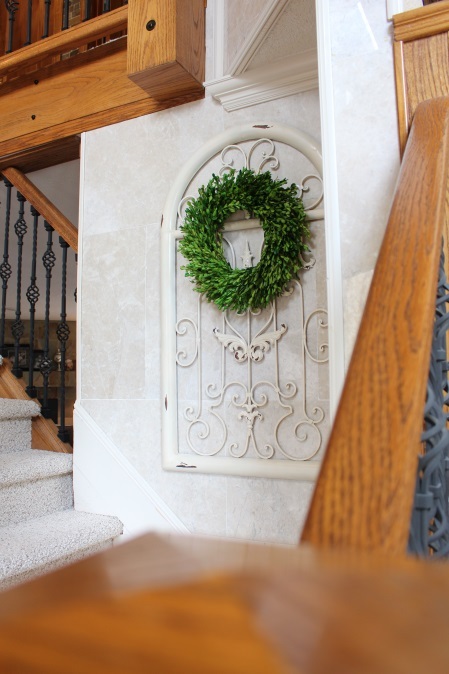 Love how this looks and the wreath is perfect for spring. Five dollars is an amazing deal, lucky you! I LOVE it!!! You inspire me to paint something 🙂 love the boxwood wreath on it as well. Wow $5.00, I would’ve snatched those up too. 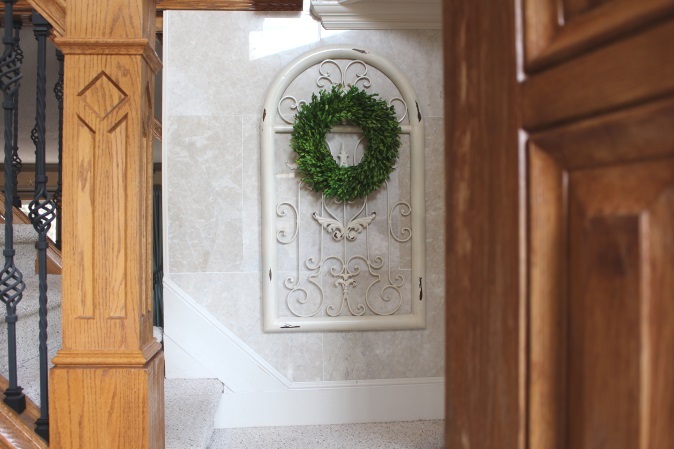 Love it in white and looks so pretty in your entry with the boxwood wreath. The perfect piece for that perfect space! This is so lovely! Love it Christy! It turned out beautifully! What a great find! How clever you are to use Vaseline! That’s a tip I hope to remember for the rest of my painting days! Thank you for sharing!! You made me feel better as I thought I was bad still having my Valentine wreath up! Love how your project turned out! 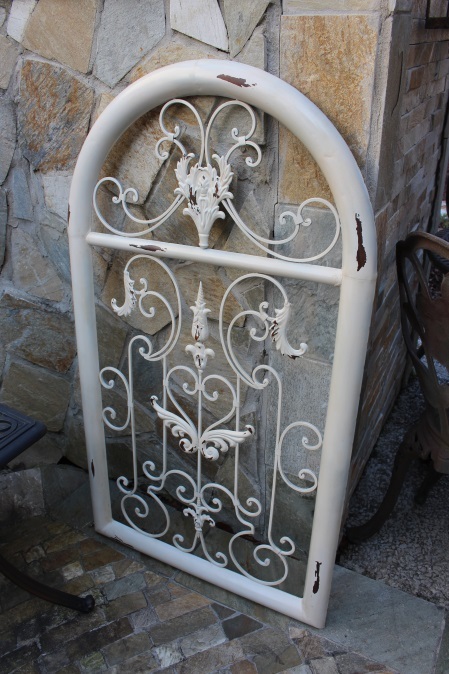 I love it with the white paint but it looked good even before you painted it – what a steal at $5! 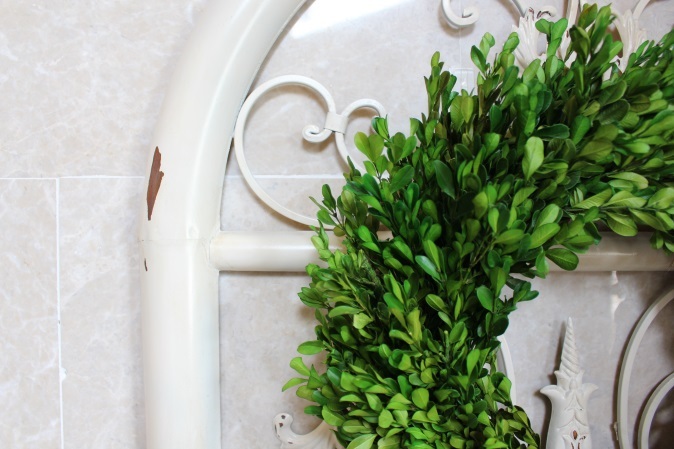 The boxwood wreath is the perfect addition for the spring time feel! Great find! You used my go to color! I love it. But the vaseline trick was one I wondered about. But why the wax? Did it change the color or finish? And don’t feel bad, I still have my Santa Clause flag hanging at my front door. But I did make a spring weath so the flag may come down tomorrow. 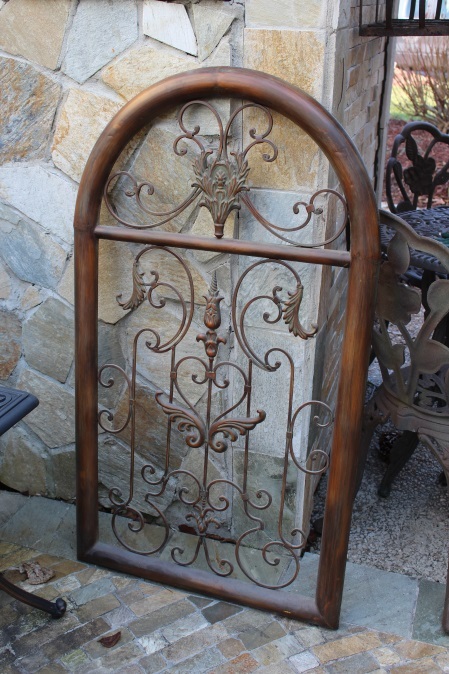 ..ok by Saturday. .
What a great find and such a perfect piece for this corner of your home. I’m glad to see I’m not the only one that let’s a season linger; I roll from a Christmas theme into Winter but I really like to change things as the season changes. Thanks for sharing! Saw you on the DIY showcase & LOVE your blog–what a great name! 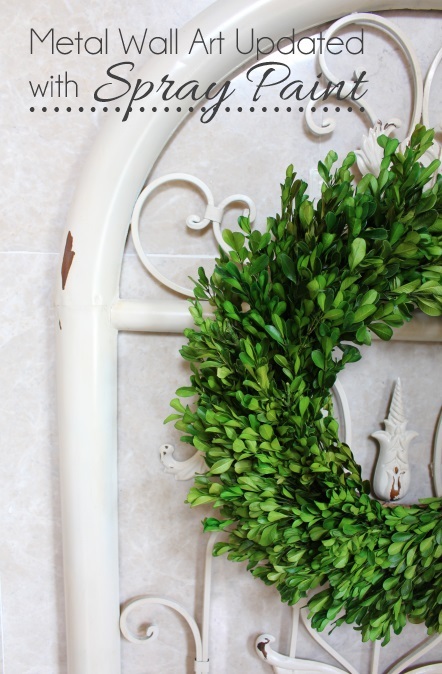 Upcycle love and a pretty green wreath!! It doesn’t get any better than that in my book!! Perfect Spring decor!! Thanks for linking up at our Monday Funday party!!! I will be featuring your post next Monday!!! Supper Cute! Love how it turned out! What a transformation! Great find! We would love for you to come link up Mondays 8:00am EST at Your Designs This Time. Thanks for linking up! Can’t wait to see what you share next Monday! What a perfect spot for this!!! Love it!! Thanks for sharing this on DIY Sunday Showcase! First of all…I love it. But I am so glad to see you use two techniques that I have wanted to try but haven’t done yet – vaseline and dark wax. Thanks for sharing – it gives me courage to try it out! Love! I especially love the boxwood against the metal. Just lovely! Receive my New Posts Right to Your Inbox! You can follow along here too! Hi, my name is Christy and welcome to my blog. This is the place where you can see a little bit of everything. From sewing to painting, reinventing to ripping down and rebuilding, with a little bit of craftiness sprinkled in between, I love a project! If you're visiting me for the first time, start with my DIY Project Gallery, found by clicking the tab next to 'Home'. Then stick around and let’s see what else we can get ourselves into! All you Need to Know to Tackle Chalk Painting Furniture! All content on this blog is property of Confessions of a Serial Do-it-Yourselfer. You are welcome to share my content (to include one photo only) as long as you provide a link back the original post. DO NOT copy entire posts, or crop, edit, or remove watermarks from photos without written permission from me first. Thank you! Confessionsofaserialdiyer.com is a participant in the Amazon Services LLC Associates Program, an affiliate advertising program designed to provide a means for sites to earn advertising fees by advertising and linking to Amazon.com. I include these affiliate links so that you can find the products I use and love. If you make a purchase through one of these links, I may make a small commission at no extra cost to you. Thank you so much for your support! Visit my booth at The Virginia Beach Antique Mall: 3900 Bonney Rd in Virginia Beach! 25+ of my own Furntiure Makeovers!